Capital Center in Indianapolis gets new lobby vibe with AlivePromo digital feature wall. AlivePromo > News > Capital Center in Indianapolis gets new lobby vibe with AlivePromo digital feature wall. June 4, 2016 – Indianapolis, Indiana – Capital Center building in Indianapolis gets new lobby vibe with AlivePromo digital feature wall. Capital Center in Indianapolis, a Hertz Investment Group property, recently updated its expansive lobby. As part of that initiative, AlivePromo was picked to engineer and deploy a video wall made up of eight large LED LCD screens. The ultra thin bezel screens give the large display matrix an almost seamless look. 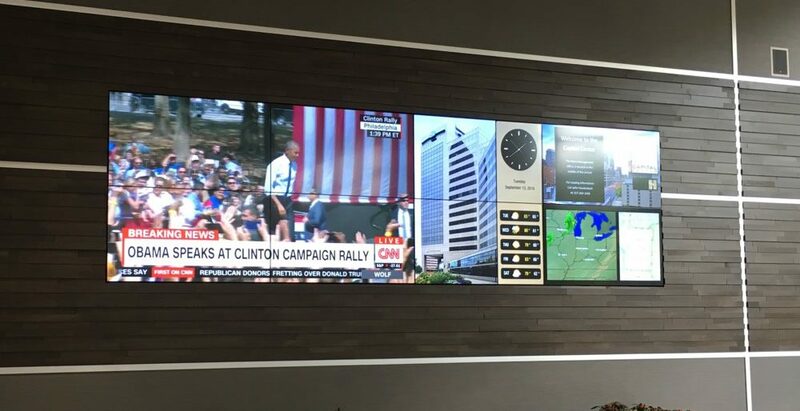 The install is a sophisticated system allowing for several types of content to be displayed on the entire matrix as a single image, or displayed on any of the eight individual screens with unique content on each screen, or any combination of screens. An audio system was included to allow for a full theater like experience for use during special events or important TV broadcasts. Town Square in St. Paul updated with AlivePromo Digital Directories. Digital Conversions - Time to toss that black electrical tape! AlivePromo is deploying more and more LED tile based projects. It’s latest project at Fifth Street Towers in Minneapolis that launches this month is a never-been-done custom triangular mosaic of LED tile. The technology, which most people know from stadiums and visiting Times Square or Las Vegas, is now going indoors as part of interior architecture. Resolutions are now good enough to be seen decently from just a few feet away, which means we are not limited to the traditional 16×9 screen in close up digital signage situations. If you see video walls with seams?…that is becoming old school. AlivePromo CEO Sam Rogers predicts, “In a little over five years from now, LED tile will be so refined and modular, you’ll be able to cover surfaces with lego-like screen segments without worry of x and y limitations.” The coming winds of this change are evident. At Infocom in Orlando this year, traditional screen manufacturers are all jumping into the LED tile game. 16×9 won’t disappear for traditional situations like consumer TV’s, but for digital signage and architectural design, the landscape is changing dramatically. © Copyright 2018 AlivePromo, Inc. All Rights Reserved.